The season did not start out the way Baker and the Twins envisioned after signing him to a long-term contract this past offseason. Shoulder problems delayed the beginning of his 2009 season and when he returned, he began by allowing home runs at an absurd pace - in his first three starts he surrendered a home run every 10 plate appearances - while his 16 earned runs in just 14 innings of work resulted in a 9.82 ERA and a myriad of questions regarding his health and effectiveness. Baker lasted an average of five innings per start with an opponent average against of .328. Baker's lateral movement on his slider returned in the month of May and his location of his fastball lowered in the zone. As such, opponents have begun to chase more pitches (38 percent OOZ in May versus 24 percent in April) and the amount of infield flyballs versus home run flyballs have inverted as well (8 percent IFFB/29 percent HRFB in April starts vs 32 percent IFFB/5 percent HRFB). His past two starts have been a microcosm of the performance he displayed last year. Aside from one inning against the Royals on May 3rd Baker has not allowed a run in 12 out of his last 13 innings as opponents have been limited to a .204 batting average. It is safe to assume that Baker is back on track. After going 6-1 with a 60-to-19 K-to-BB ratio and a 2.74 ERA in his 65 innings from August 3rd to September 26th of last year, it was presumed that Liriano would carry this into the next season. His velocity was back up and his secondary offerings were getting more swing-and-misses but it was a far cry from his 2006 version. No rational fan assumed that Liriano was waltzing back in through the Dome's revolving doors this year but even still this F-Bomb 2.0 had seemed to have found a way to keep opponents off-balance without the dirty slider. His first four starts in April were littered with control issues - 9 walks and two hit batsmen in 21 innings with pitches in the zone 44 percent of the time - in addition to that, an overwhelming portion of those baserunners were crossing the plate (57 percent LOB pct) leading to his 6.04 ERA. In his two most recent starts, Lirano's accuracy has improved (50 percent zone presence) and he has gotten more missed bats at pitches outside of the zone (72 miss percent on swings on swings out of the zone) after increasing the usage of his slider and changeup in the month of May. Though his overall approach might be different, in Lirano's last start against the Mariners he was tagged for three extra base hits and five earned runs in five innings. The right-handed batting Mike Sweeney, Jose Lopez and Adrian Beltre accounted for all of the extra base hits. His one trouble spot is right-handed batters thus far in the season as righties are slugging 123 points higher than the left-handed opponents. 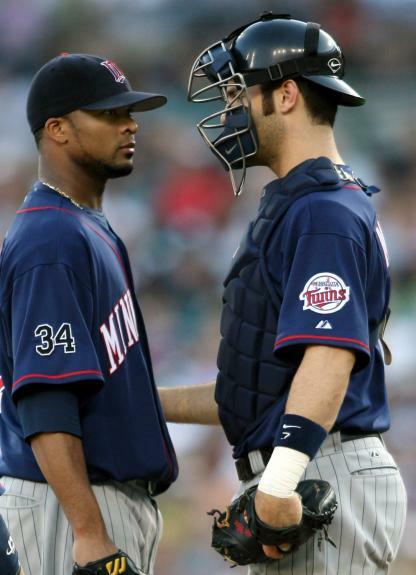 In 2006, Liriano used a diet of non-fastballs (57 percent) against right-handed batters. Last season Liriano had curbed this (47 percent) while this year has seen him thrown even fewer non-fastballs to them (42 percent). More non-fastball offerings should help quell this onslaught. 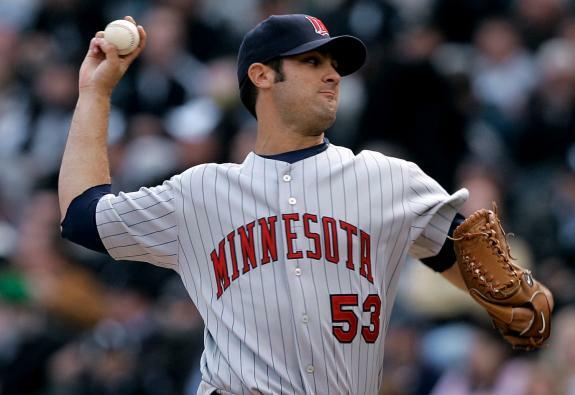 Slowey's 5-1 record will undoubtedly earn him the reputation as the Twins' best starter to date - which is merited when you look at his K-to-BB ratio - but examining some of his other numbers also indicate that he has been damn lucky too. True, his three inning loss to Baltimore was cruel and unfair considering the weather-related circumstances, but Slowey has been the benefactor of nearly seven runs of support per start which has helped him grab those five victories in spite of posting Game Scores averaging 45 and opponents slugging .547 off of him. 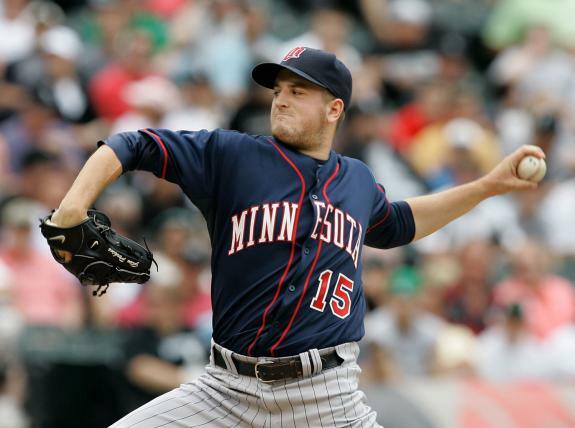 If that pace continues Slowey will wind up being this season's Glen Perkins. His ability to get ahead (67 percent first pitch strike) and stay ahead (only 11 percent of batters have had three ball counts) has ensured that batters will have to find gaps in the defense to get on base. In the early portion of the season, there have been more holes than usual as he has an unreasonably high batting average on balls in play (.390) that will drop as the season progresses and with it, the overall average against. So this is what below-average runs support feels like? A year ago Perkins received 12 wins thanks to 6.23 runs per game. 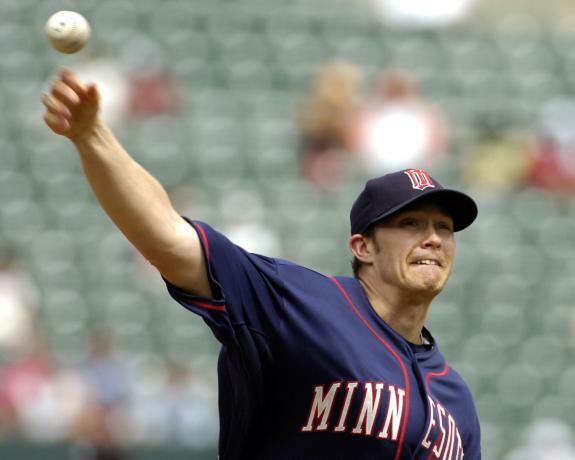 In his first start of the year, Perkins threw eight innings of one run ball but the Twins failed to score a single run that game. In his next start he held the surprisingly powerful Toronto Blue Jays lineup to just two runs but was not the pitcher of record when the Twins won the game in the 11th inning. 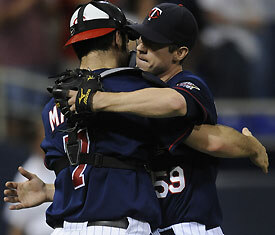 Perkins has been cuffed around in his last three starts allowing 13 earned runs in 17 innings of work. Opponents have found seams with groundballs and launched three home runs in that span (as a pitcher that is flyball heavy, this was bound to happen). What is noteworthy is that his line drive rate is down from a year ago and he has been more successful versus right-handed opponents. Both of these shifts is courtesy of the increased use of his slider. In 2008, Perkins used his slider just 4 percent of the time to righties while this year he has thrown it 16 percent of the time. In turn, righties are hitting just .226, down from .288 last season. Nick Blackburn simply does not have the luxury of having his walk rate inflate. As a contact-oriented pitcher, Blackburn thrives on keeping additional runners off the bases but with his BB/9 up to 2.38 from 1.82 a year ago, it throws this system out of whack. More baserunners means more runs are likely to cross the plate. Up until his most recent start, Blackburn possessed a nerve-wracking 13-to-10 K-to-BB ratio, a dangerous ratio for a control pitcher. If anything, Blackburn's last start against Detroit reaffirmed the notion that he is in control and is able to hit his spots. Blackburn finished seven innings, allowing just five hits and no runs while tying his career-high strike out of six. Blackburn's line drive rate is down considerably (15 percent versus 21 percent) while his groundball rate has gone up (48 percent versus 45 percent) which is a good sign from the right-hander. What Blackburn needs to figure out is how to keep lefties from smashing him around the ballpark (.488 slugging) in addition to what exactly is keeping him from throwing well on the road (.497 slugging away from Dome).